1) Hamlet, how did you come to live with Darla? Hello, Tara, and thank you for having me on your blog. Actually, to answer your questions, Darla came to live with me. My previous caretaker, Darla “Dee” Pettistone, brought me into her house almost ten years ago when I was a feral kitten. (As you can see, I grew into a handsome specimen, indeed). But Dee, like all humans, did not have seven lives, and she finally went to the land of cream and catnip. Her great-niece, Darla, who was named after her—humans are so unoriginal when it comes to names—inherited her building and bookstore. All I got was Darla, MOL (for humans, that means, meow out loud)! 2) What is your day typically like? My days are quite strenuous. Late at night, I wander from the apartment down to the bookstore and back again (I have my own secret passages in the building), and sometimes even slip outside for a bit of air. Just before the sun rises, I settle down in the apartment for the night. But when Darla wakes up, I get up, myself, and eat some breakfast. Then I take a morning nap, get up after an hour and make sure the bookstore is in order, take a mid-morning nap, wake up and have a snack, take a late morning nap…and it continues that way until it’s time to do my nighttime wandering again. So, as you can see, I have my paws full. When I have time, I check up on Darla and James and Robert to be sure they are doing their jobs in the bookstore properly. One can never be sure about humans. 3) I've heard there is some prejudice out there against black cats...have you experienced any of that? 4) Darla isn't exactly what you would call a cat person...how do you cope with that? I am not one of those boring lap cats (no offense, Tara, if you are), so I prefer a human who does not fawn all over me. Darla has proved a trainable human, and so we get along. She brings out my food and water on schedule, which is about as much as can be expected from a lesser being. 5) Your particular feline sleuthing style is quite unique...can you tell us about it? I continue to be amazed by the fact that humans have no interspecies communications ability, and so they cannot understand feline speech. That means I have to resort to other ways to communicate information to Darla and her friends. Since we live in a bookstore, I’ve found the easiest way to get my point across is with books. When Darla has a question, I simply pull down a volume from the shelf whose title gives her the answer. It is not my fault that she is not always intelligent enough to understand my meaning, even when I give her numerous book titles by way of explanation. But eventually she manages to figure out what even a kitten would know in a flick of a whisker. 6) What kind of mischief do you get into in A Novel Way to Die? Mischief is a misnomer. I simply was making sure that the neighborhood was safe from miscreants and was unfortunate enough to witness human on human crime. And it seems that even the police suspected everyone but the actual killer, no matter how many clues I gave them. The one happy event was that Darla hired a new clerk for her store, a young human male named Robert. Like me, he favors black in his wardrobe and is quite clever for not being a cat. 7) What's next for you and Darla? I suppose I will not be giving away any secrets if I tell you that our next adventure will find yet another human meeting an untimely end. But, even more disturbing, I find myself teaming up with a canine to help solve that mystery. You may keep that last to yourself, Tara. What a cute little post..Makes me want to run out and read these books right now..Great job Tara. Hi Tara. Hamlet says thank you for a fun interview. And he also says that he will give away a copy of A NOVEL WAY TO DIE to someone who comments on this post. So tell all your kitty friends to come by and read! I love this interview and I can't wait to read more about Hamlet and Darla. 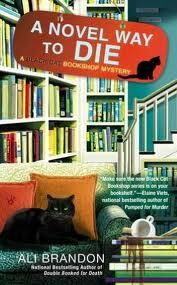 I read Double Booked for Death and loved it, would love to win this one. Oh my, a cat teaming up with a dog! I guess you have to do what you have to do. I love the post and also would love to read this book. Nice interview. Can't wait to read. I bought the first in the series earlier this year. I'd love to win the book. I love cats and books. I own three black cats. Hamlet sez, thanks for all the Hamlet love, and good luck in the contest. By the way, you can "like" Hamlet on Facebook: facebook.com/blackcatbookshopmysteries . Since Hamlet the Cat was otherwise occupied this weekend, Ali Brandon's cat Sundance (in the profile picture with her)randomly picked the winner of the giveaway. And that person is *drumroll* Carol Wong! Carol, congratulations! I will email you for your address. Thank you so much Diane, Hamlet, and Sundance!!! Cute post! Enjoyed reading about Darla!